Art. That is what video games are often called. 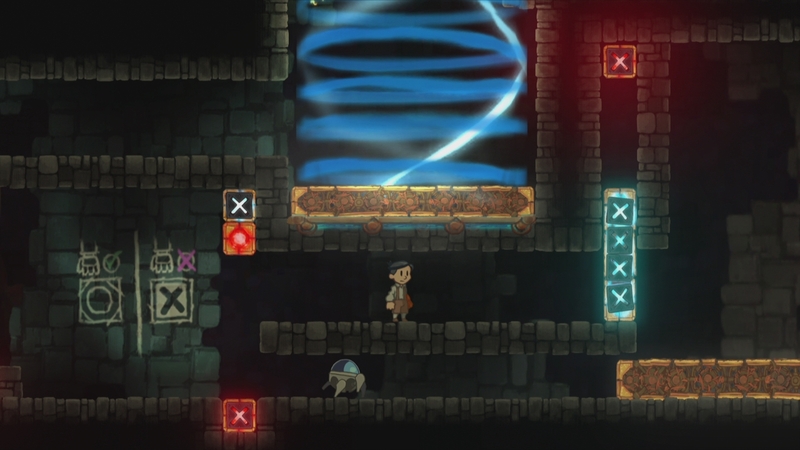 Rain Games wants you to believe it and feel it in your amygdala when they made Teslagrad. We’ve heard of many independent 2D platformers trying to pretentiously capture the idea of an “Art Game” with artistic styles. They usually try to underhandedly blend the puzzle element with the platforming (and water it down) so it presents an illusion of cinematic feel by suppressing the reflexive parts of gameplay and enhancing the thinking and watching part of the game. You might even roll your eyes at the idea of an art game. Or maybe you just enter a state of bliss and accept being carried by this form of game. Will you shed a tear at the overblown beauty of a game because it presents itself like a screensaver background? 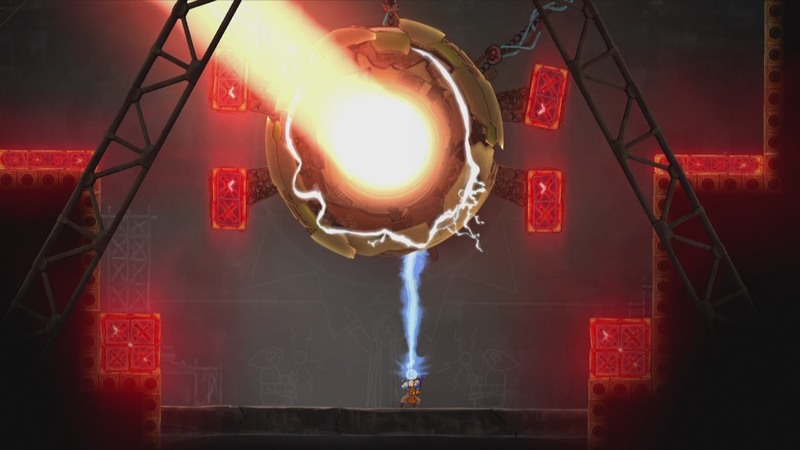 Well, now that we’re done talking about the Trine games, let’s actually describe Teslagrad! We’re going to be specifically talking about the Wii U version, since it features the more extensive features as a two-screen experience. Teslagrad is a game that presents itself like a picture book with no words. You start as an orphaned boy given away at birth, now a kid running away from the king’s guards. No, this boy’s name is not Teslagrad. In fact, until I actually sat down to write this review, I just realized I was never told his name! It is so seamless you don’t notice it. Abstract storytelling is the path Teslagrad chooses, and it’s up to you to figure out what is going on through artwork on walls, plays going on in the background of certain rooms and intense imagery of character movement. Notice how this games subtle wall-writing teaches you how to play the game seamlessly! Then, when you escape the annoyingly-placed guards (who seem to have way too much interest nabbing a young male child), you realize you’re playing another one of these kind of games. Yes, you are essentially playing another Metroidvania. Don’t roll your eyes, once that bit of shock value goes away, the captivation starts. You soon acquire the tricks of magnetism in the case of red and blue powers that let you turn specific platforms their respective color. Left trigger punches blue, red trigger punches red (you can use the face buttons or even customize the controls to begin with). You learn quickly that red on red repels and red on blue attracts. The game adds more layers once you acquire the ability to throw on a colored shield (left shoulder button for blue, right shoulder button for red) at whim to not only mix in what you change around you, but to change yourself. In theory to change the world around you, you must change yourself. Adapt or perish. Teslagrad is not a one-trick pony, however. 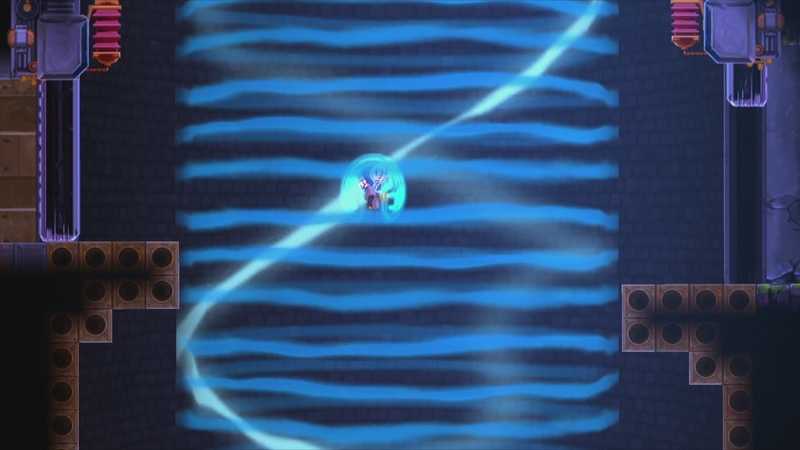 On top of eventually being able to turn specified platforms red or blue from long-range, later in the game you get the ability to zip through solid surfaces in an electrical light form! While this is a Metroidvania, where you need to go is a very linear experience. Every time you go somewhere you’re probably not supposed to go to, it’s probably locked, there’s a crack in the wall that you somehow can’t break (yet), you get zapped or there are magnetic variables you can’t reach yet to effect your progress. So don’t worry about being lost, but you also have the option to backtrack and explore thanks to the magnetic field that allows you to visit older rooms without going through the hoops you went through before. Being on the shorter side, there’s not a lot of bosses. The bosses you do face, however, challenge what you’ve just recently learned and make you remember your past lessons. Every boss feels like the equivalent of taking a school test in the final exam format. It’s more like a language or mathematics test, because, in order to pass your current lesson, you have to remember old material, as well. This includes remembering, during one particular boss battle, that, while you now have the ability to project your own magnetic shield to repel things away from you, the enemies from the beginning of the game that bump into you put a blue or red shield on you, forcing that color onto you! This ends up throwing off your game plan and getting you killed by having a blunt object repel back into you! Speaking of getting you killed, I shouldn’t forget to mention the one-hit deaths. That sounds a bit extreme on paper, but trust me when I say it isn’t. You remember how I mentioned puzzle elements? 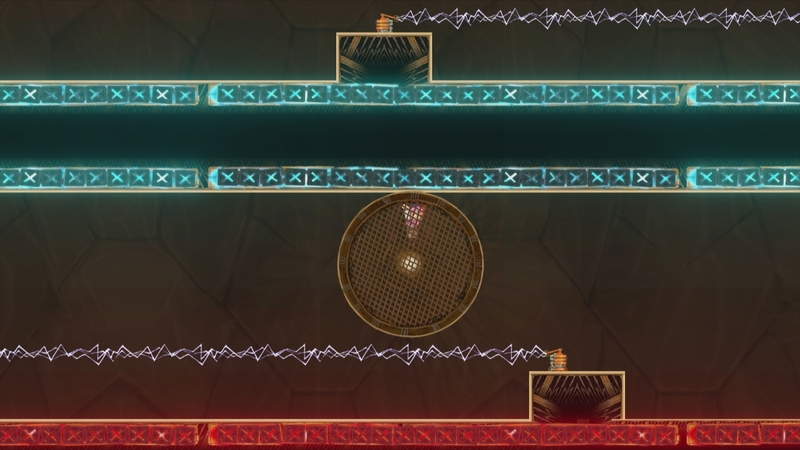 This is a puzzle-platformer where you do need actual reflexes to platform, as well. Trust me, the platforming itself can be very creative and mentally stimulating. The difficulty of the game, however, is scaled down to compensate for the one-hit deaths. You start off in the nearest entrance to the room you died in. The difficulty, challenge and the actual puzzle element is about figuring out how you take on a boss or a series of platforming. The puzzle part is figuring out what you have to do to succeed and what kind of reflexes you will need. You have to figure out that you need to use a blue shield to propel yourself upwards, but, then, remember to stop right before you hit electricity on the ceiling, then quickly zip over and change to red to attract yourself onto the blue ceiling. Now that you know to do that, do you have the reflexes to do as stated? Are you smart enough and skilled enough? What are your strengths and weaknesses? Towards the end of the game, you will run into the oh, so famous Metroidvania trope. The never-ending backtrack horrors! If you don’t have 15 collectable storytelling art scrolls (of the 36), you cannot progress! Which means you must go back and explore the world with all of your newly-acquired powers that make you feel like a pro. Now, this is not inherently bad. When I say that, I mean it’s not just some never-ending collect-a-thon where you just arbitrarily walk to hidden spots to collect scrolls just for padding. Some of these scrolls are absolutely harder than the main game platforming to get. The game magically taught you how to play in sublte ways that need to be done more in gaming. This is for the honor students. This is the AP class of the game. If you collect all 36 scrolls, you can get more elaborate ending. A prouder ending worth the 100% completion of the game. It took me five hours to get to the regular ending, but, when I went back to backtrack before I completed the game, it added on about another hour or two. It can be perceived as a short game, but its quality is worth the asking launch price of $15 (which has gone down, but I’m judging it for its launch price). Teslagrad’s artwork is very unique and reminds me of elegant Western European paintings. The fluid, 60-frames-per-second animation is wonderful. It reminds me of some of the animation I would see in old school cinematic platformers such as Another World and the original Prince of Persia. Sometimes the game stutters and freezes to load the next room, which breaks the immersion. It doesn’t happen often enough to ruin the game, but, considering the history of western developer QA, it’s a blessing how smoothly the game runs without the magic of the usual Nintendo polish. The sound engineering is amazing, and, if it’s in regards to the Wii U version, the sound coming from the GamePad is a delight. Headphones are a must for ASMR-centric individuals. The ambience of the music is delightful; sonorous on the ears and choir only chiming in when necessary. This is a wonderful blend of retro customs with modern possibilities. 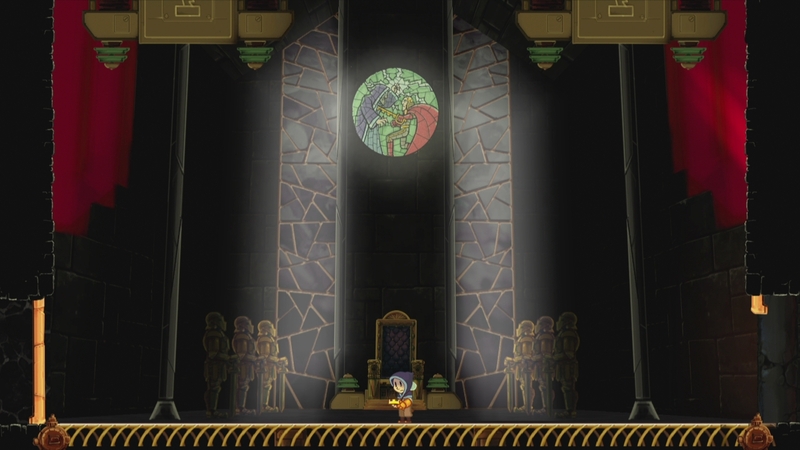 To talk about the Wii U version of Teslagrad more specifically, it’s a mixed bag. Having the map be on the GamePad is excellent and takes advantages of the strengths of not having to pause the game and look where you are. However, it feels pointless when there is no cursor on the map telling you exactly where you are in the room. It just flashes which room you’re in. Being that this game was available on other systems and with the lack of attention for the more intuitive map system, they should have allowed for Wii U Pro controller support for those who don’t want to carry a heavier controller while playing. It’s not a game you want to have your hands weighed down on all the time. Players could still look at the map while playing with the Wii U Pro controller. The game itself doesn’t favor the joystick, so it’d be a nice fit to play with a classic controller considering a classic style of gameplay. I might even suggest the Wii Remote on its side to provide old-school NES controller feel, but that doesn’t have enough buttons, so I won’t complain there. The second screen experience is still a necessity, though. I honestly find it hard to game without it these days. Teslagrad is a work of art that seems pretentious on the surface, but, trust me, it isn’t. Oh, those smart Norwegian developers at Rain Games can make themselves stars if they keep this kind of effort up. Teslagrad is just the total package; the polish, the genius craft of level designs, abstract exposition and just plain outright charm. It’s only fair to laud this game for standing out from the pack of the usual “art game,” not succumbing to the dated tropes of Metroidvania while keeping the good and finding an amazing balance of being a fairly challenging game while also feeling like a breeze to play through! It may be short, but it’s sweet, like a delicious ice cream bar. You’ll only want more and I guarantee you will want to pull a 100% completion for this game. In fact, please do! It’s worth it. 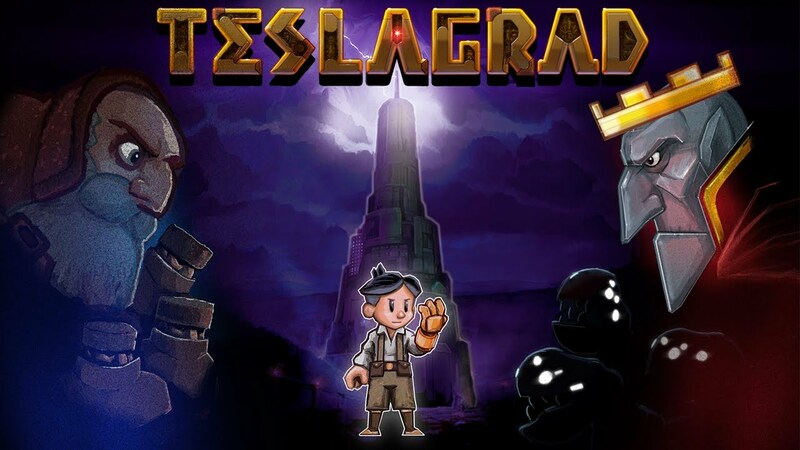 Before I go, I must make a pun: I’m Teslaglad to play Teslagrad! Get it? No? OK, you get the point. The game is phenomenal. Louis is a youthful but old-school gamer from New Jersey who is partially of Japanese descent and he's totally frilly! He's been gaming for practically as long as he's been alive with a early-on fascination for Kid Icarus, with his other favorite franchises being Klonoa, the Tales series, Sonic The Hedgehog, Final Fantasy, Castlevania and Ninja Gaiden. He's a total hipster for Nintendo as well appreciating cult classics like Earthbound and Eternal Darkness. His favorite genre is JRPGs, which is an obvious inspiration why he joined the campaign of Operation Rainfall at it's launch. He's a gamer who demands quality and charm out of his games because if he doesn't get it he will let it be known.